Potafiori is a perfect example of the cool, unexpected layer that is slowly cloaking Milan with a number of hidden jewel destinations. 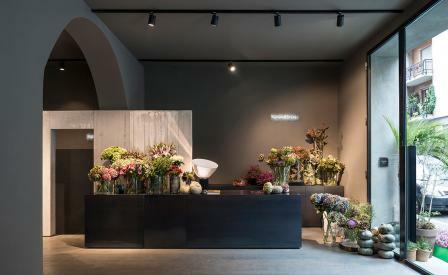 Part flower shop, part cocktail bar and all day restaurant-cafe, the eclectic scene is governed over by Rosalba Piccini, a jazz singer and florist with bright red hair and a vivacious, winning personality. Piccini runs the floral-laden locale like an all day café as well as a bustlingly nightclub, offering fluffy cappuccinos in the morning and often breaking out into jazz songs while her rowdy friends bang out tunes on the piano during aperitivo hour. The infectious, unusual activity unfolds in a space that is just as unexpectedly stylish. Designed by Michele Pasini, Barbara Ghidoni and Marco Donati of Milan based architectural firm Storage Associati, the locale has the sleek look of a high-end, minimally drawn spa. The duo broke down all of the small partitions within the space and built up clean walls in concrete panels to support the original arches of the 20th century building’s interiors. Long benches were cut from huge slabs of Ceppo Lombardo, a rugged limestone found locally, as was a buffet bar that houses both food and flowers, and a fountain for watering plants that features custom designed brass pipes. Meanwhile, the earthy wood floors, restored and painted an oatmeal colour, contrast with the mud grey walls, an iron flower bar, as well as black laquered tables with matching Cassina chairs.